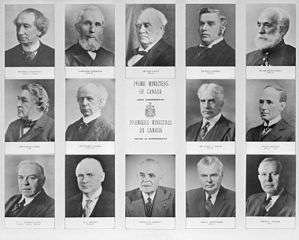 Pick one of the Prime Ministers listed to the right. 5 significant dates in the Prime Minister's life. 5 significant people who influenced the Prime MInister (and not just his mom, though for King that might work). 5 significant places where he lived, worked, built something, etc. On the puzzle provided, fill in these bits of information and the name of your particular Prime Minister. Put one piece of information on each puzzle piece. The Prime Minister's name should appear on every piece. Show your work to your teacher. Neatly cut out the puzzle pieces. Trade the pieces of your puzzle with other people so that you have at least one puzzle piece from each Prime Minister. You should have the right puzzle pieces so they will all link back together. When you have one piece from each prime minister, glue them back together to form a complete puzzle once again. Show your completed puzzle to your teacher. It should have 20 Prime Minister facts about 20 different Prime Ministers in a puzzle that fits neatly together. Share the two most amazing facts with your teacher.